Robots are leaping into the sporting arena. Social media feeds are teeming with soccer-playing robots, running, rolling and stumbling across the pitch to kick goals. Search for “dancing robots” on YouTube and you’ll soon meet a talented troupe of androids, twirling alongside their human creators or performing their own rendition of Gangnam Style. Despite their dancing and soccer prowess (or lack thereof), there are many sporting pursuits our robotic friends are yet to conquer. Inspired by his passion for tennis, Master of Engineering (Mechatronics) student Robert Chin set out to build his own tennis-playing robot as part of final year engineering design project. “My ambition is to one day build a robot that could deliver a legal serve in tennis,’’ he says. Mr Chin says that to help a robot see a ball, you would first need to think about the ball as an object that flies through the air. Robots can sense moving objects that are restricted to a single plane, such as the ground. However complexity increases when the object moves in three-dimensional space. For example, it is easier to teach a robot to catch a rolling ball than a thrown ball. “Complexity increases for thrown balls because a whole new dimension is added – height above ground. There are a greater number of possibilities of where the ball could be,” says Mr Chin. 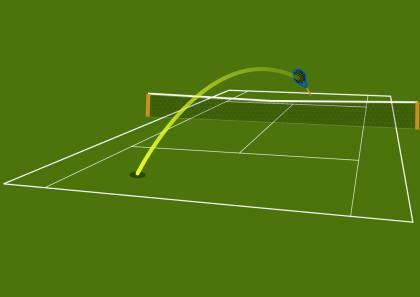 Watching tennis courtside or on television, we humans use player position and bounce location as cues to guess where the ball is headed next. Robots can use these cues as well. But with players serving up to 263km/h, tennis is a fast-paced game. And our vision, which helps us play the game, is a sense that is already saturated with information. A tennis-playing robot would have a glut of information to work through, in a short amount of time. “Compare this to a simple ruler. It measures one thing: length. It is a single number that a computer can process easily,” explains Dr Denny Oetomo, Mr Chin’s supervisor. With this mind, the age of tennis-playing robots skilled enough to challenge Roger Federer or Serena Williams is still some years away. The human visual system is remarkable at interpreting and processing the world around us. I think it would be a while before the reflexes and precision of professional athletes can be matched. “The human brain has an extraordinary capability to learn and generalise and we can form an internal model of events through learning and practice. 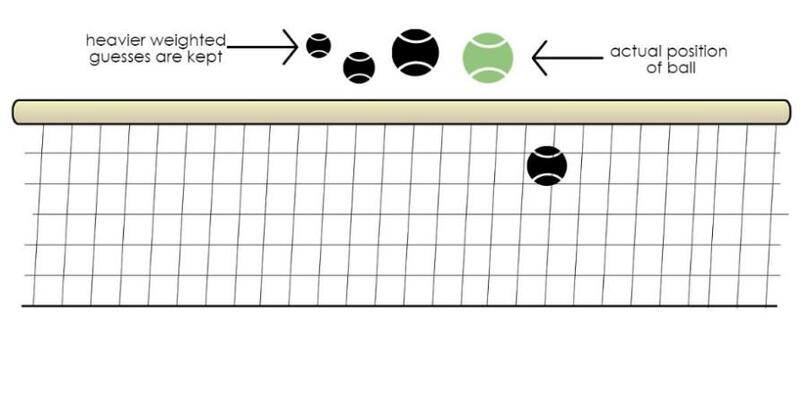 The ‘practice makes perfect’ exercise allows trained athletes to react to a high speed serve without needing to observe the trajectory of the ball. This is because they have learnt how the motions of their opponent connect to trajectory their serve,” explains Dr Oetomo. To give this human ability to robots, Mr Chin employed an artificial intelligence technique called Particle Filtering. “At every instant the robot guesses a location for where the ball might be, almost at random. It generates so many guesses, that one of those guesses must be close to the correct guess. We then measure how close each of those guesses are,” says Mr Chin. The closer a guess is to the tennis ball’s actual location, the greater weight a ball has. Guesses with a heavier weight are kept for the next round of guessing, filtering out guesses or particles that are unlikely to represent the location of the ball. 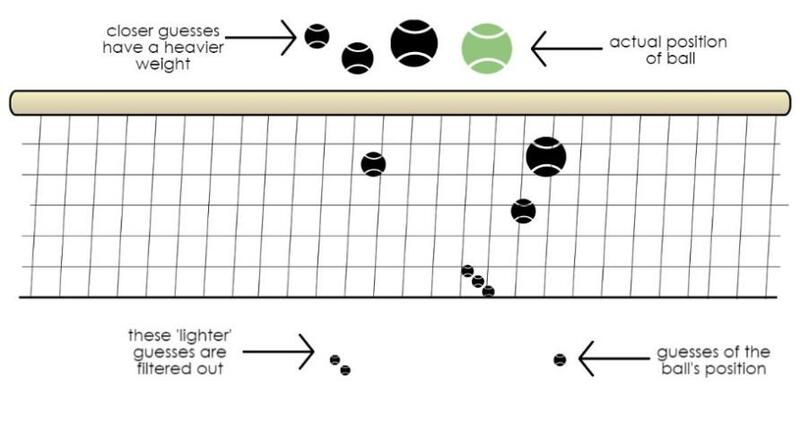 While this process is not used by humans to learn tennis, it does help robots build an approximate representation of the ball’s location. Aside from creating tennis-acing robots, Mr Chin hopes his design could applied to other sports and be used as the basis for a coaching tool. Mr Chin’s project was featured at Endeavour, the University of Melbourne’s annual showcase of ingenious and inventive designs created by engineering and IT students.